Do Sugary Drinks Boost Blood Pressure? Here's another reason to cut back on soda and other sugary drinks: A new study suggests that even one sweetened drink per day may contribute to higher blood pressure. MONDAY, February 28 (Health.com) — Drinking a lot of soda and other sugary beverages has been linked to an increased risk of obesity and diabetes, among other health problems. Here's another reason to cut back: A new study suggests that even one sweetened drink per day may contribute to higher blood pressure. A blood-pressure increase of that magnitude is not a major cause for concern, so the findings may need to be taken with a grain of salt—or not, since excess sodium is still the prime offender when it comes to high blood pressure (hypertension). It's not uncommon for a person's blood pressure to fluctuate by 1 or 2 points within a single day, says John Bisognano, MD, the director of outpatient cardiology and hypertension at the University of Rochester Medical Center in New York, who was not involved in the new research. However, Dr. Bisognano adds, blood-pressure increases that might seem negligible in an individual could add up to substantial public health risks when multiplied across entire populations. "From a public health standpoint, if you could lower blood pressure 1 to 2 points in individuals over a community, it's a big deal," he says. "It could translate...into fewer strokes and maybe fewer heart attacks." The study, which included about 2,700 middle-aged men and women in the U.S. and U.K., doesn't prove that sugary drinks directly increase blood pressure. In fact, the study suggests that people who drink soda and similar beverages tend to have an unhealthier overall diet and lifestyle than people who don't, which makes it difficult to pinpoint the effect of sugary drinks. 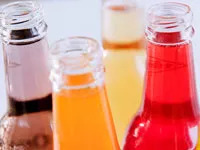 In addition to consuming more sugar and calories, the study participants who drank sweetened beverages consumed fewer nutrients and were several pounds heavier, on average, than their counterparts who avoided the drinks. Although the researchers took these and other factors into account, they acknowledge that the food questionnaires they used aren't foolproof and that the apparent link between sugary drinks and blood pressure could have been shaped by additional, unidentified factors. Maureen Storey, PhD, the senior VP of science policy at the American Beverage Association, a trade group that represents the manufacturers of soda and other sweetened drinks, said in a statement that the average blood-pressure increases seen in the study are "inconsequential" and within the standard margin of error. Because the study looked only at a large cross section of people and did not follow individuals over time, it "does not and cannot establish that drinking sugar-sweetened beverages in any way causes hypertension," Storey said. "Finding a very weak association between two things does not establish a cause and effect relationship." Nevertheless, the authors say their findings suggest that people should consider cutting back on sugary drinks—not just salt—to improve their heart health. Water and 100% fruit juices are good alternatives to sugary drinks, although even 100% juice contains sugar and "a high calorie count" and should be limited to one serving per day, says Ian Brown, PhD, a research associate at Imperial College London and one of the authors of the study. "Moderation in everything is the bottom line here," says Dr. Bisognano. "There's a whole list of choices to make that could all make small differences, but an answer to high blood pressure or to cardiovascular risk isn't going to be one specific thing."